In this article we are going to describe how you can show your customers how much they have saved by purchasing goods at a discounted price. 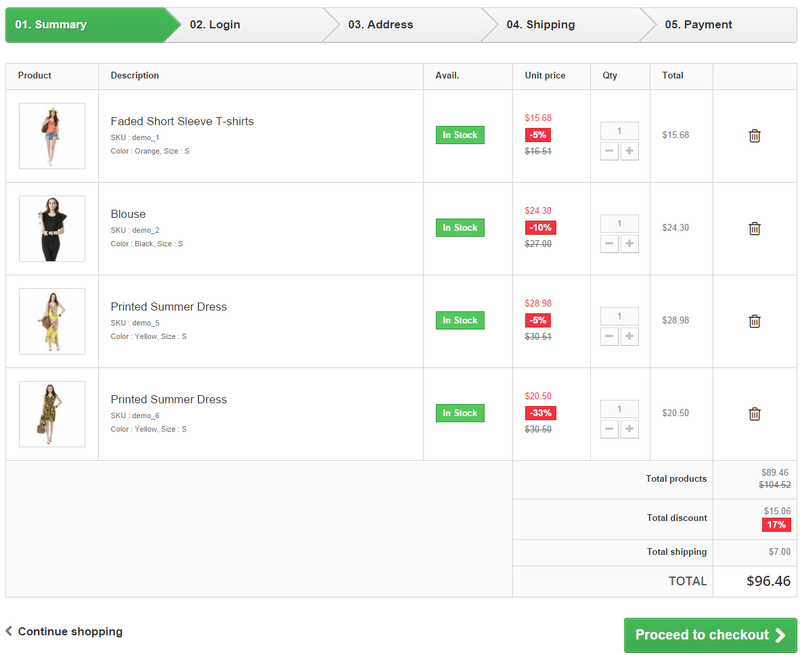 We will also show how to calculate and output total buyer’s savings onto the shopping cart page. Here you can try out the working sample. Here you can also download the template file “shopping-cart.tpl“. Hi Alex, first of all, thanks for your tutorials.Hi Alex, first of all, thanks for your tutorials and help. I have found a mistake, if you select in your demo the product “Blouse (demo_2)” and you go to the cart, you can see the product with the discount you have in the catalogue (10%), but you can see in the line of “Total discount” 11%. You are calculating this percentage from the price ($27) not from the final price (discount included) ($24,30). If you buy more than 1 product, the same mistake. Thanks a lot! I fixed it. Can you please specify why do you need to know this? Order total is the total sum of all products + shipping – discount coupon etc. You need to know all summands that make the total sum. Thanks for the article and tutorial. It works until you change the quantities and then there is no update to the total saving. Can you solve this? It’s just an example, in order to work with ajax-based shopping cart, you also need to make changes in the .js files in your theme. Please contact our support team at store@belvg.com for the solution. This is awesome. I’m looking for a way to add the total before discount to the invoice and the total discount. Can you help me. I just can’t seem to get it to work. Thanks, the link was fixed. Thanks for the comment. It’s a good notice, but here it’s necessary to modify not only the js-code, but also php-controller that processes Ajax call which returns parameters after cart refreshing. Unfortunately to describe the whole process will require too much time.